If your company needs a variation of your website for Canada and USA customers, you may want to have two versions of your website, each targeting a specific country. First of all, I think it’s a good idea to have those variations – this way you can address customers in a more personalized (or should I say localized?) manner, have pricing in CAD / USD and even provide different contact information specific to the country. With modern technologies and content management systems, it’s pretty simple to implement. Depending on your needs, you can either have a clone of your website setup on another domain and then customize the content, or, in some cases, make a website “smarter” by programming region switch and using variable content blocks presented based on the visitor’s country. Content management systems like WordPress make it simple – you can have multi site setup with WordPress, so both sites will be served by the same copy of WordPress – that means less maintenance (backups, updates, etc) for you. If content differences are minimal, you may also use multi-lingual setup and treat the content for additional country as a different language. 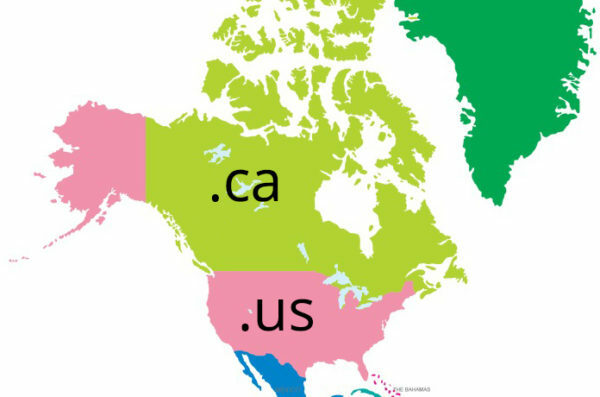 You can use different domain names, for example YourBusiness.ca and YourBusiness.com, or maybe YourBusiness.us and have a copy of your website running on both, with some location specific variation. One important thing piece which should not be overlooked is SEO. Generally speaking, Google doesn’t like duplicate content. So, if your company’s About page is same on Canadian and USA versions of your website, that’s a duplicate and Google may ignore it. Plus, if you are using different domain names, you have to do a double effort promoting your website and doing search engines marketing. We don’t want to double the work, right? So, follow the best practices advise from the Google – Use hreflang for language and regional URLs. Now, what does that means in plain English? That means, include simple meta tag in your webpage header to tell search engines that the page has an alternative version for audience from another region. It’s that easy! Here is a post from Google with some technical details of implementing this technique. Let me know if you have any questions about making your website attract clients from USA and Canada! I help small businesses to get more customers and automate processes using web technologies. I will help you to setup S.M.A.R.T. goals for your business and together we create web strategy to reach your goals.